Independent Transport Videos are proud to present this archive video presentation of the iconic AEC Routemaster bus running in service with East Yorkshire Motor Services of Hull. The video was shot by transport photographer Malcolm King in the late 1980’s and features the Routemasters running in service around Hull and its environs. Malcolm now takes up the story…..
“East Yorkshire Motor Services of Anlaby Road Hull bought several AEC Routemasters in1988 to run the 56/56A service from Ferensway to the Longhill Estate in the east of the city. The Routemasters had been lovingly painted into the traditional dark blue and primrose livery. For those passengers old enough to remember it was like turning back the clock, to see crew operated half cab buses in a colour scheme that had disappeared some 20 years earlier from the streets of Hull. On entry in to service some of the Routemasters lacked the white roof markings but this was added in a matter of weeks. The first day of service saw TV crews interviewing management, passengers and crews. At that time a Bristol VR in same livery, fleet no. 519, was allocated to Hornsea garage. I suggested to the managing director that this be transferred to Hull as a spare vehicle for use on the 56/56A service. Several days later this reallocation occurred. 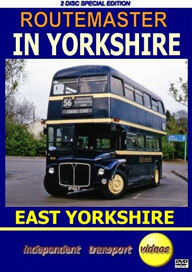 East Yorkshire obtained several more Routemasters from various sources. In the end this gave 19 vehicles for service use plus several for spares. Routemasters also saw service on other routes, before their demise in Hull on Sunday 2nd September 2001. Scarborough and District, an East Yorkshire subsidiary used several of the Routemasters on the famous 109 sea front service, these being converted to open top, running in competition with other operators. ……So take your seat and enjoy this nostalgic video presentation featuring the iconic Routemaster running in service many miles away from its natural home in London! Duration : 118 minutes (approx).